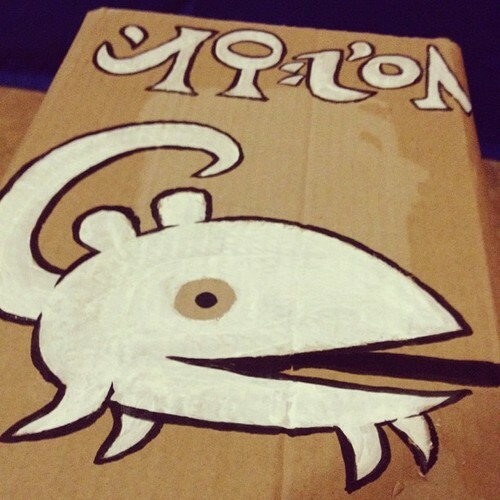 This is just a hurried photo run-down of an outstanding day. 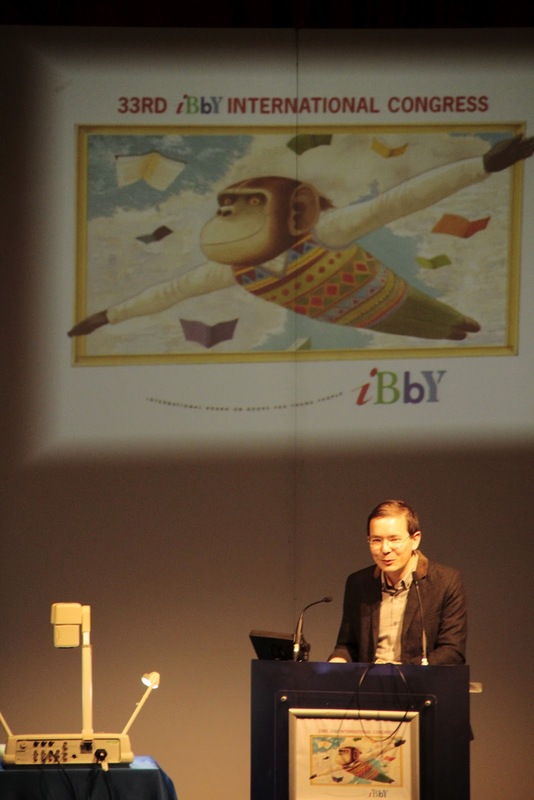 With thanks to the hardworking organizers of the IBBY World Congress 2012 for inviting me to speak. IBBY stands for International Board of Books for Young People - it's an international network committed to bringing books and children together. The congress' theme for 2012 is Translations and Migrations. When he finished, the packed auditorium gave him a long, long round of applause. I'm hoping Sarah got a nice snap of me and her - my pictures of her came out terribly blurred! Boo. The wonderful Verna Wilkins, founder publisher of Tamarind Books (now an imprint of Random House), had the slot before mine. 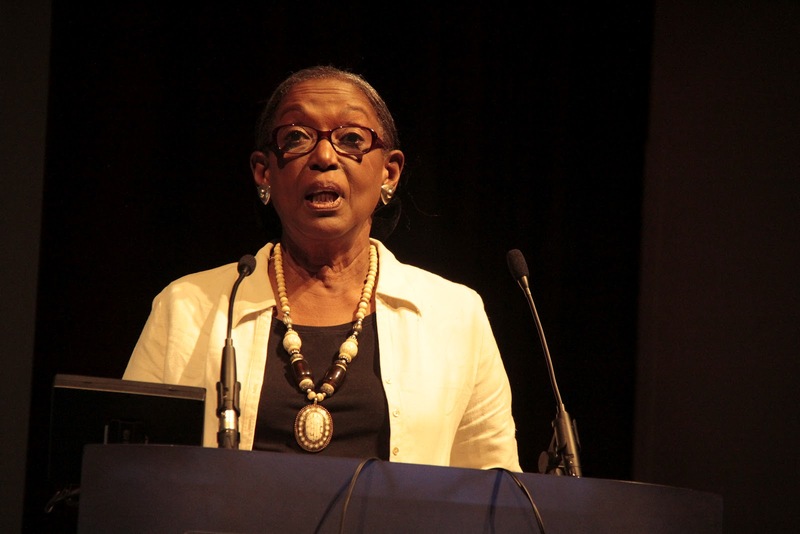 She told the story of her struggle to redress the balance of diversity in children's books. I blogged about Verna in 2008 - have a look. My talk followed Verna's - I wrote a brand new presentation just for the Congress titled 'Motherless Nation?' ... named after a BBC Radio 4 documentary I made in 2005 about the social consequences of the Philippines' migration phenomenon. The talk was a bit rushed because all the timings became squished, but hopefully I will have the time to post a meatier version of my talk on this blog later. 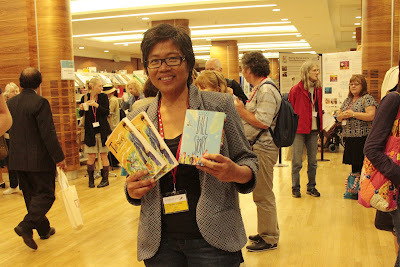 Random House sponsored Verna and my events at the Congress - but quite independently, Ibby's Pam Dix contacted me several months ago to request my help in creating a film to celebrate the IBBY Honour List of authors, illustrators and translators - a biennial honouring of outstanding books put forward by IBBY's member countries. Pam worked with children of diverse backgrounds from three North London schools, sifting through the Honour List and discussing books that caught the children's attention. I then met the children and filmed them talking about the books they chose. Seeing the children up there on the big screen was wonderful - I was so pleased to be part of Pam's project. Thanks, Pam! We are hoping to obtain permission to bring the film to a bigger audience. Watch this space! 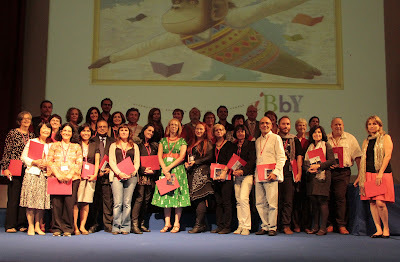 After the film was screened, Honour List authors, illustrators and translators who had managed to attend the Congress came up to receive a certificate. 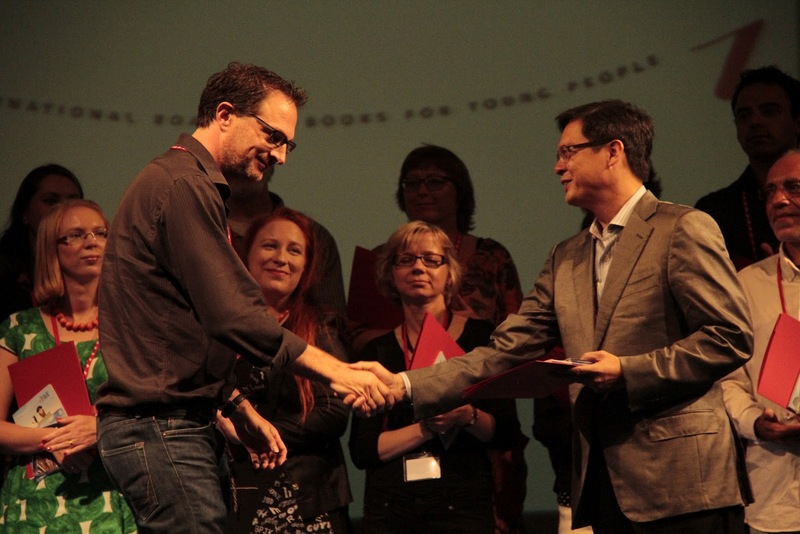 Marcus Sedgwick's Revolver was one of the chosen - here he is receiving his certificate. Here are Honour List winners from all over the world! I hung out with Dee Shulman at the signing table during the coffee break. 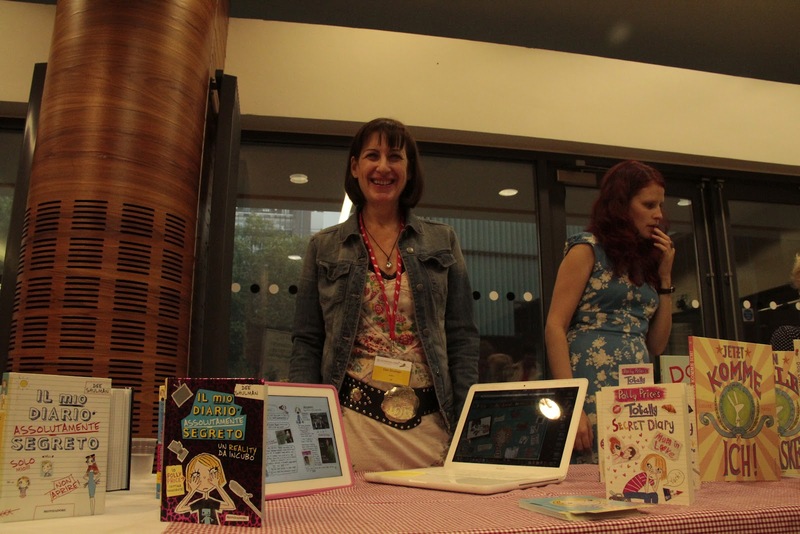 That's Louise Yates in the background. I also managed to catch a talk on immigration in picture books - I've been working on picture book texts lately and it was utterly inspirational. I sketched out plot ideas as I listened! One of the speakers was Susanne Gervay who I'd met at a Bologna conference when I was still a desperate-to-get-published author. Here she is talking about her autobiographical picture book Ships in the Field. Dee very kindly took a photo of me. I often forget to get a photo of myself at happenings like this because I'm so busy taking photos of other things. Thanks, Dee! That's all for now as I'm rushing around tonight. Thought I'd post these photos before events overtook me again. See you again soon! Sorry not to see you, Candy! 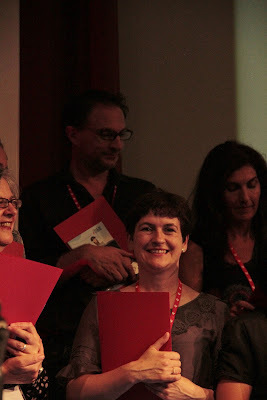 But I did meet my Dutch translator for Stravaganza, who was on the Honour List for a David Almond book. 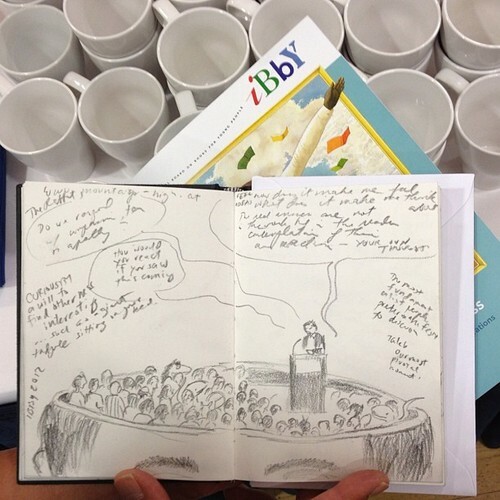 I saw you over the crowded room - it was such a packed conference! Hope your event went well. Thank you both for your enthusiasm and your input! Most important in an event like this. After two years planning it's great to see the congress taking on a life of its own in connecting people! 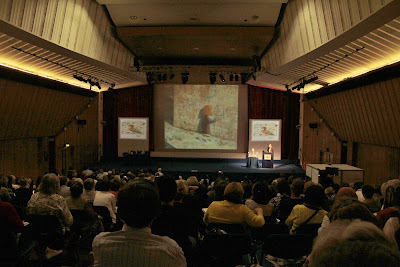 All the plenary sessions were filmed and, together with many of the papers, should be put online by IBBYUK before too long. Fantastic to hear that all the plenary sessions will be online. This was an outstanding Congress. Congratulations to all the organizers! So great to meet you, Candy, and I love your post - yes, the whole Congress was fabulous. I'm still assimilating it all! Thank you too Marjorie! Hey, I've got some nice pics of your family and Susan! Will send when I can!